Wow, you have stunning beautiful photos and lovely variety of recipes! I am taking this one, and I do think I'll use it for a dessert. This site really is looking great. How did you do the blueberry shot? Thanks to both of you :-) Sandy, this definitely makes a great dessert! The only change I think I might make next time is cut the amount of almond extract mixed with the blueberries. The flavors are great together but after eating these for a couple of days, I decided the almond was a little overpowering. If you make them, you might want to try using 1/2 t. of almond extract instead of a full teaspoon.About the photo: I am very new to food photography and I don't know that much about photography in general so every good shot I've taken up to this point has been pretty much accidental :-) For this one, the blueberry bar was sitting in the middle of a big white tray and I just got as close as I could. I've been using natural light instead of a flash so the latest photos have been taken towards the evening when I have good light coming in through the kitchen window that isn't too harsh. I just keep taking them until I get something I like. Unfortunately I don't have photoshop so I really have to make sure I capture what I want since I can only do basic editing with Picasa.I am trying to learn more about photography. I have a great camera and I'd like to be able to take full advantage of it! Here's an informative site about digital photography that I've been checking out and I've also learned a lot from studying other food photos on Flickr. Sometimes I ask questions about the photos I really like. wow that looks soooooooo good! Love your site and your recipes! For those of you who like to keep things a bit healthier, I just baked these and modified some of the ingredients to try to make it a bit more nutritious for my little man! (and me of course!! ha ha) On the bottom layer I used 1/2c of brown sugar and for the flour I used whole wheat. In the middle layer, I eliminated the sugar completely (why do we need to add extra sugar to berries we already love as they are???!!!). For the top layer I used 1/3c white and 2/3c whole wheat flour. It turned out GREAT! SO good and it was a huge hit with my son as well :) Thanks for posting the recipe up! Oh your recipes are great. I'm happy to read your blog every day. 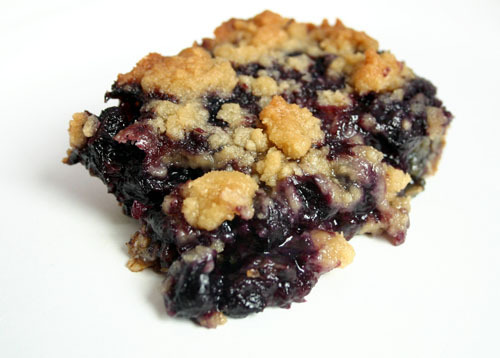 As for this recipe, I have also my favorite blueberry bars recipe, here it is http://cookiteasy.net/recipe/blueberry-crumb-bars-1019669.html Besides blueberry I like here vanilla (used also in the recipe you offer) and cinnamon. Once I skiped cornstarch in this recipe and bars weren't worse.